Physicist Brandenburg gives us an explanation of the Cosmic Jesus and the metaphysics of the Bible and what it says about the cosmos. Brandenburg reveals: the relationship between GEM theory (Gravity-Electricity-Magnetism) and Gematria; the importance of Israel being on the Silk Road; the Aquarian Nazareth; The Genesis Catastrophe; and The Revelation. He introduces the idea of a One God of Law who was master of all Physics and the Cosmos. Brandenburg discusses the Greek philosopher Aristarchus of Samos (200 BC), his work on the modern structure of the cosmos and his influence on the Biblical Paul (who also had a companion named Aristarchus). He shows how the Bible appears to contain a sophisticated mathematical allegory centered around Jesus and the fifth dimension of Kaluza-Klein and GEM theory that runs through millennia; in this allegory Jesus is the repairer of the effects of the collapse of the fifth dimension to subatomic size. Brandenburg tells us how we must facilitate human contact and travel to the stars and establish trade in ideas and merchandise with those who dwell there. We must be proactive in this, and not wait for others to come here—we must make every effort to go to them! 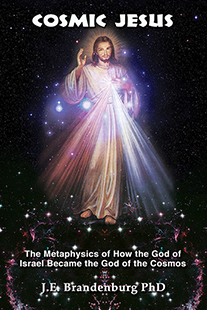 COSMIC JESUS: The Metaphysics of How the God of Israel Became the God of the Cosmos By John E. Brandenburg, PhD. 364 Pages. 6x9 Paperback. Illustrated. References.